Tommy Cash, the youngest brother of the late Johnny Cash, picks a flower petal off the star presented to Johnny Cash on the Music City Walk of Fame, Oct. 6, 2015, in Nashville, Tennessee. Country stars Miranda Lambert and the late Johnny Cash, along with famed blues musician Steve Cropper, were honored Tuesday for helping to build Music City's reputation as a home for artists of any genre. The three musicians, along with Gaylord Entertainment business executive E.W. "Bud'' Wendell, were given stars on the Music City Walk of Fame in downtown Nashville, Tennessee. Miranda Lambert poses in the press room with the multiple awards at the 50th annual Academy of Country Music Awards at AT&T Stadium, April 19, 2015. Lambert, a two-time Grammy winner originally from Texas, said she first came to Nashville a decade ago as a contestant on the talent show "Nashville Star,'' but has spent the better part of her career on the road. When she finally took some time off of touring and moved back to Nashville, she said she felt like it was home. 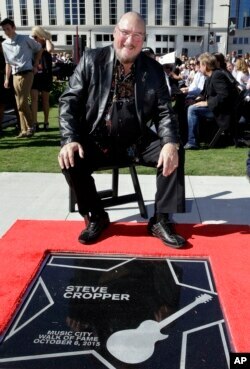 Famed guitar player and songwriter Steve Cropper is presented with his star on the Music City Walk of Fame, Oct. 6, 2015, in Nashville, Tennessee. Cropper got his start at Stax Records, in Memphis, Tennessee, as a guitarist with Booker T. and the M.G.s, The Mar-Keys and later as a member of the Blues Brothers with John Belushi and Dan Aykroyd. But he was drawn by country and studio musicians, including Chet Atkins and Hank Garland, and moved about 30 years ago to Nashville, where he also has a studio. "I have always said that Nashville has some of the greatest musicians that have ever walked on the Earth, period,'' Cropper said. Cash's youngest brother, Tommy Cash, accepted the honor on his brother's behalf. Wendell, an executive who helped to grow the Grand Ole Opry and Gaylord Entertainment, also was inducted.